The V72 was developed at the NWDR (North West German Radio) in the period between 1949 to 1952 as a microphone and main studio amplifier under the technical supervision of Prof. Nestler the former Head of R&D of Telefunken ELA (Electro Acoustic) Lab. Following the Stockholmer Radio conference ,where Europe set the beginning of the Ultra Short Wave Radio or in better terms FM radio, new equipment with a better frequency response and S/N ratio was needed. Because most pre-war equipment had been deported or destroyed, the NWDR developed a complete new standard for the German radio network in cooperation with the IRT in Hamburg (Institute for Broadcast Technology). The V72 was modeled on the basis of the V41 (developed in 1928 by Telefunken), but with modern parts like the Noval glass tubes and in a smaller housing – the “Danner” cassette module. The first 300 units were build at the NWDR Zentraltechnik up to serial#100 and to Serial#300 by Maihak with a set of EF40 (the post war version of the EF12), but later changed to a better version of the EF40, the EF804s. The perfect partner for a tube microphone – The vintage V72 was developed in 1953as a universal studio amp with a fixed gain of 34dB to compensate for the signal loss of passive filters and faders in modular studio mixers. It was designed to be used anywhere in the signal path from microphone input signals (preferably from high output tube mics like the Neumann U47) to full line amp applications. 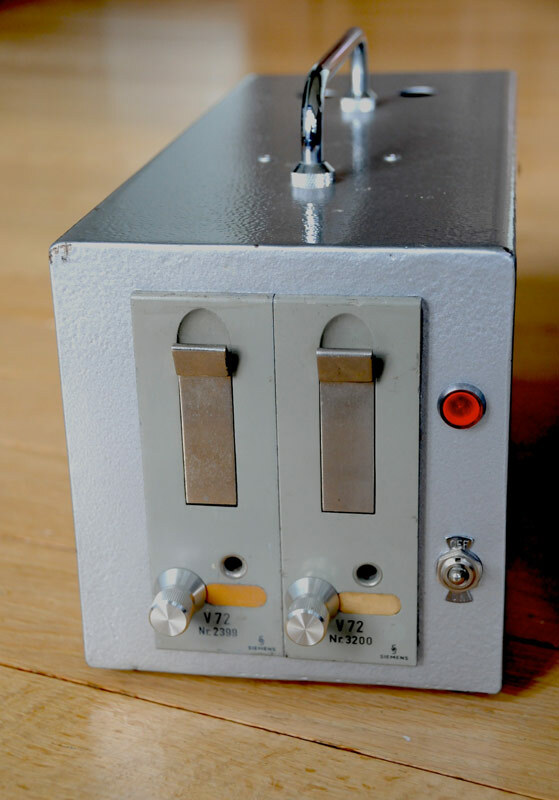 The high quality balancing transformers at the signal input and output and the mains transformer are shielded with multilayer mumetal/copper technique. Up to 1955, it was the standard preamplifier in German radio stations; with the introduction of the V76, it was pushed back as an input module, then only used as a buffering amplifier. (In 1963 it was de-commissioned by the IRT and replaced by the V72t transistor version.) An estimated 25,000 V72s were built for the German Radio Network alone by several different companies. The early ones were build by Maihak and Telefunken; in 1954 Siemens and TAB joined the production team. Aside from the German radio stations, the V72 was used by most of the European Recording Companies like EMI, Decca/Telefunken, etc. In 1966 the production stopped at Telefunken; Siemens stopped the production in 1964 but built the V72b version up to 1966. TAB was the only company that built the V72a up into the 70s. As already mentioned, the original design of the V72 goes back to 1928 with the V41; closely examined, it is, except for the gain control, nearly the same amplifier. After WWII Western Germany built the V41b (Telefunken/Maihak/EAB/Siemens) up to 1949 and replaced it with the V72, eastern Germany built it to 1958 (Funkwerk Erfurt/C. Lorenz AG/RFT) and then replaced it with the V241. The unit is fully self contained, it includes its own 220V power supply and all connections (as the mains supply and the balanced input and balanced output) are accessible through a single 12pin Tuchel connector. The 1uF capacitor in the input circuit creates a bass roll off and can be bridged for a smooth bottom end. 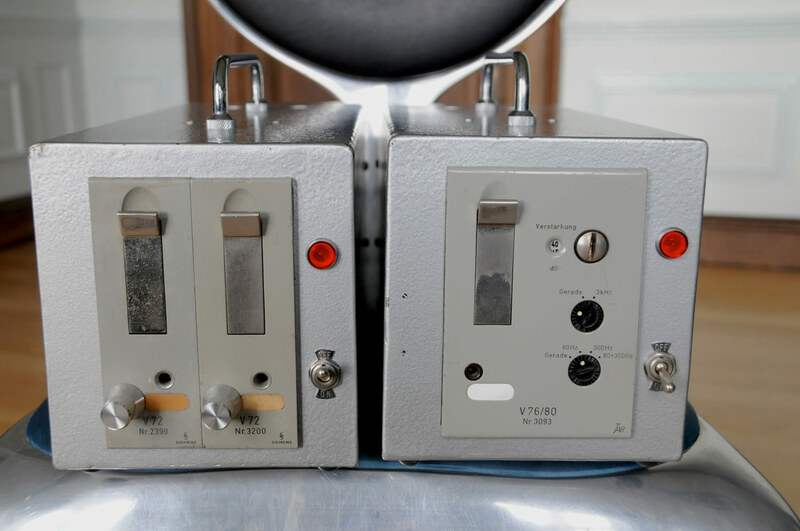 The Pentodes Telefunken EF804S used in the V72 are common types and are still available. The V72 was designed for exact 220V and is very critical with mains voltage. In countries with lower mains voltage a step up transformer has to be used.